Pavlova is a meringue-based dessert. It is a meringue dessert with a crisp crust and soft, light inside, usually topped with fruit and whipped cream. 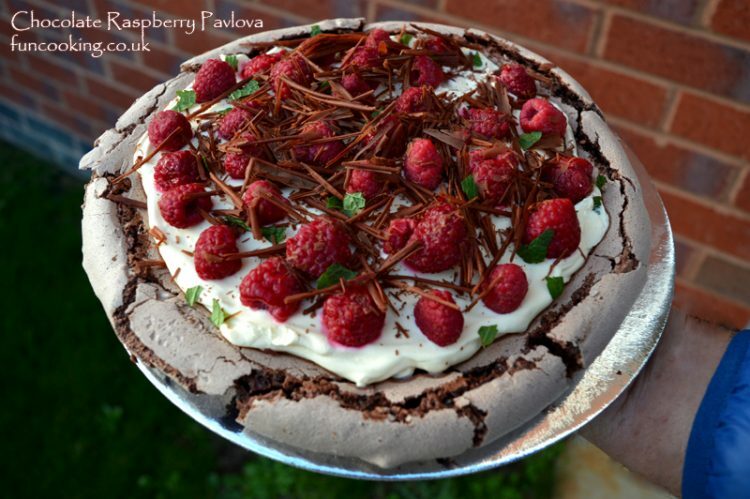 This recipe is chocolate flavored pavlova which is served with whipped cream, fresh raspberries and mint. The combinations are just perfect and delectable. Pavlova is sweet but raspberries are cutting down that sweetens which is making is heavenly delicious. This recipe is perfect for big gatherings and parties. You can make it 1-2 day ahead and serve cold. Preheat the oven to 180 C/160 C Fan/gas mark 4/350 F and line a baking tray with baking parchment. Beat the egg whites until shiny peaks forms, and then beat in the sugar a spoonful at a time until the meringue is stiff and shiny.Sprinkle over the cocoa and vinegar, and the chopped chocolate. Then gently fold everything until the cocoa is thoroughly mixed in. Mound on to a baking sheet in a circle approximately 8 cm in diameter, smoothing the sides and top. Place in the oven then immediately turn the temperature down to 150 C/130 C Fan/gas mark 2/300 F and cook for about 45 minutes. When it’s ready it should look crisp around the edges and on the sides and be dry on top,but when you prod the centre you should feel slight softness beneath. Turn off the oven and open the door slightly,and let the meringue disc cool completely. When you’re ready to serve, invert on to a serving plate. Whisk the cream until thick but still soft and pile it on top of the meringue, then scatter over the raspberries. Coarsely grate the chocolate over the top. Sprinkle mint leaves on top.